Opponents of Christianity raise challenging questions about the origins, authorship, age, and reliability of the twenty-seven books of the New Testament. When the authenticity of the New Testament is questioned, so is the gospel. 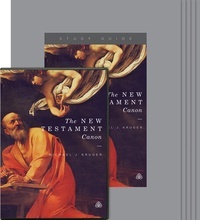 In this series, Dr. Michael Kruger critiques the most common objections to the canon and presents abundant evidence that these books are the authentic, true, and inspired Word of God. This is a series to help dispel doubts and give you confidence that the right books, and only the right books, are in the Bible.